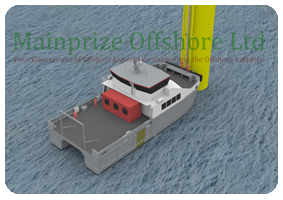 Designed using the lessons learnt from MO1 & MO2, Mainprize Offshore's latest vessel MO3 is a market leader in the multi-purpose offshore vessels below 24 metre load line length. With a massive 187m2 of deck area, 60,000 litre fuel oil capacity, 40,000 litre fresh water capacity, and 45,000kg deck cargo it has a unique capability. With the provision for 6 x 20' containers, dedicated welfare facilities for all onboard, and large survey style bridge it boasts many unique features that have made their vessels stand out from the conventional WFSV. Other vessel features include a large Palfinger deck crane, dedicated 4 point mooring system, bow and stern fenders, fuel transfer system, and fresh water transfer system. 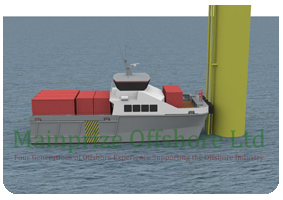 The offshore support vessel is fitted with twin Caterpillar C32 diesel engines driving fixed pitch propellers that will gives the vessel a service speed of 24 knots even when fully loaded. 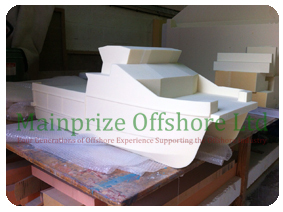 The first vessel currently under construction at Strategic Marine in Vietnam for Mainprize Offshore.